The Lorraine cross with the crown on a green three-topped hill as the left part of the Hungarian small CoA, has been used since 12th-13th century, and since the 16th century it has been standardized. AFAIK, the CoA with the crown is fully incorporated in the Hungarian legislation, but possibly there is no explicit statement as above. The inclusion of such statement, which would certainly mean something as symbolic and political sign in the Cosntitution, would be of little impact on the flags which would not be changed, as far as I understood. There must be something more which can't be seen from this extract, since the crown of St. Stephen is already part of the coat of arms of Hungary, and (unofficially, but often, as part of the CoA) also on the flag. I have not been following the flag-related political development in Hungary, but IIRC, the rightists are very much fond of introducting the flag with CoA as official (and possibly only) flag of Hungary, instead of the simple tricolor. The Slovak CoA and the dexter half of the Hungarian CoA are remarkably similar. Only differences: Slovak CoA is a white cross of Lorraine on a blue mount composed of three hills, on a red background. The Hungarian CoA is a white cross of Lorraine with a crown at the base on a green hill composed of three hills on a red background. There is no doubt about the use of the arms with the Lorraine cross by Arpad and further dynasties ruling the Hungarian territories. But there is archaelogical evidence that this symbol was used in the area inhabited by Slav (later Slovak) population before the Hungarians conquered the Carpatian Basin. This old Christian symbol was brought to Great Moravia by the Byzantine priests Constantine (Cyrill) and Method. This doesn't refute the theory of the pope as the donator of cross for king Stephen but shows that Slovaks have certain rights to consider this cross as theirs. In Hungarian history this cross is first noticed on the shield of king Bela III. in 1189 and it is a frequent symbol in Slovak municipal heraldry. Ludovit Stur (1815 - 1856) took the Hungarian royal coat af arms and used it with an appropriate change of colours as a Slovak national symbol. The main fact why Slovaks used Hungarian coat of arms was that they simply felt a historical bond with the Hungarian state - the coat of arms belonged to them as well as to Hungarians or for example Serbians who lived within the boundaries of Hungarian kingdom. They only painted it with the colours they liked more because they represented the pan-Slav or Austro-Slav idea. A stamp with historical CoA-s from the legendary TURUL to nowadays can be seen at http://www.historicaltextarchive.com/hungary/hungshi7.gif. I was asked: ""Szent Corona" means "saint's crown" in Hungarian. Is that term used frequently to identify St Stephen's crown? The answer is no. The Holy Crown (Szent Korona) is the crown you can see as part of the nowadays Coat of Arms. No data about the form of St. Stephen's Crown. Only legends. The Holy Crown was the crown of King St. Stephen by the legends. The Holy Crown is symbolised the country and its people (of course before 1848 only lords, nobles) by the Idea of the Holy Crown. The Holy Crown ruled the country not the king. See information in English at http://www.historicaltextarchive.com/ . The institution of kingship in Hungary was established by King Stephen I, who was later canonized. His work of organizing the state and the church was embodied in the royal crown, which he received from Pope Sylvester II in the year 1000. He had himself crowned with it on the first day of the new millennium, while the rest of Europe quaked at the prospect of the end of the world and the coming of Antichrist. This crown received from the Pope had a double significance. On the one hand it meant that the Hungarian king was spiritually a direct dependant of the Pope, and not, therefore, a vassal of the Holy Roman Emperor. So it symbolized, within bounds, the sovereignty of the kingdom. On the other hand, it was an emblem of secular rule given by the Pope to the king so that he might support the aspirations of the Roman Catholic Church in the country. In depictions of the time, this crown bears no resemblance to the crown of today. The crown of King Stephen was the kind of jeweled open crown worn by almost all European monarchs at the turn of the millennium. Although the first crown disappeared, the belief persisted for centuries in Hungary that the Holy Crown was identical with the one donated by the Pope to crown the king who founded the state. So what happened to the original Crown of St Stephen? The most likely of the many views expressed by historians is that the original Hungarian crown was plundered by Henry III, Holy Roman Emperor. Since Hungarian sovereignty was temporarily suspended at the time, Henry returned the crown to Rome, where it vanished, or at least its fate is unknown. The present crown, however, is also a relic of St Stephen. It is probably an amalgam of a reliquary for a skull and a Greek crown presented in about 1074 to King G�za I by the Byzantine Emperor Michael Ducas. It is presumed that the Holy Crown known today, symbolizing Hungarian kingship, existed by 1166. So the finest, most radiant relic of Hungarian history is more than 800 years old. However, the crown went through every conceivable adventure down the ages. There can hardly be another historical art object that has been hidden in as many countries, places, castles, mansions and fortresses. Battles and wars were fought and thrones toppled for possession of it. On occasions it has been lost while being brought back to Hungary from abroad. There were characters in history who simply purloined it, and others who kept it in secret. It has even been pawned, and buried during flight. It has been taken out of the country many times, and on each occasion, its return was a cause for solemn, national celebration. A special institution was set up to protect it, with guards chosen from the highest men in the land and a special military detachment. Supporters of the extreme right-wing Hungarian government at the end of the Second World War took the crown to the West, where it came into the hands of the US military. The crown and other crown jewels were then kept in the United States, and some repairs even done to them, until 1978, when Secretary of State Cyrus Vance, at the behest of President Carter, ceremoniously returned them to Hungary. Since then, the crown and regalia have been on public display at the Hungarian National Museum. The crown has two parts. Most researchers agree that these were merged in the last quarter of the 12th century. On the lower part of the crown, which is of Greek origin, one of the enamel plates shows the bust of a king with the legend in Greek, "Geza, Loyal King of Turkia" (i.e. Hungary). On the king's head is a diadem that resembles the lower part of the crown without its upper parts and pendants. This, as mentioned, was presented by the Byzantine emperor to G�za, whose consort was the daughter of a Byzantine patrician. The upper part of the present crown closely resembles a medieval reliquary for a skull. In its original form, the bands forming a cross may have been adorned with pictures of the twelve apostles, surmounted by a plate holding the four bands together and bearing a picture of Christ Enthroned. When the reliquary was incorporated into the crown, one panel was cut from each band, leaving a total of eight pictures of apostles. Istvan is, of course, right, but this small semantic difference that is so obvious to Hungarians is not quite understood by others, not even to Austrians and Croatians whith whom their history was so much intermigeled. So, what Hungarians call Holy Crown is called (in ignorancy) by "everybody else" (when they have need for calling it anyhow) St. Stephen's Crown. It is centainly so in Croatian documents regarding the crown (once it was a big issue in Croatia as if that crown "could" be set above the Croatian shield). The same happens in English, German etc. heraldry sources. They all talk about St Stephen's crown as a way of designating what Hungarians call the "Szent Korona", rather than as authenticating a historical claim to the "real" crown of the saint. 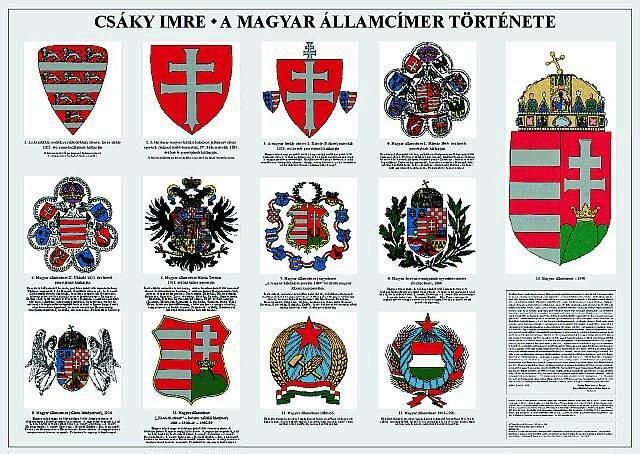 Here is a page with approximately all historical CoA's of Hungary. Shields are not really historicals and for 1868-1918 it shows the middle CoA. "This is the so-called "Kossuth Coat of Arms", as introduced by Louis Kossuth, Governing President of Hungary, in 1849. The Kossuth Coat of Arms is based on the "Small Coat of Arms" of Hungary which was determined by a Royal Order in February 9. 1874, confirmed in 1895 and 1916. The two major differences between the Kossuth Coat of Arms and the Small Coat of Arms of Hungary are that the Kossuth Coat of Arms. 2./ does not carry the Hungarian Holy Crown on the top. The heraldic right side of the Kossuth Coat of Arms is divided by red and white stripes seven times representing the seven Hungarian tribes that arrived in Transylvania in 896 A.D. and are called the "�rp�d-stripes". The four white stripes represent the four main rivers of the historic Hungary: Duna, Tisza, Dr�va, Sz�va. On the heraldic left side, the three green hills represent the three main mountains of the historic Hungary: T�tra, F�tra, M�tra. On the middle hilltop, from an open crown, the "apostolic" double cross emerges which was awarded by pope II. Sylvester to I. Saint Stephen, the first Hungarian king (1000 A.D.), in recognition of his mission to turn the pagan Hungarians to Christianity. The red background, the white "apostolic" cross and the green hills constitute the colours of the Hungarian national flag: red, white and green. On March 15, 1848, the Hungarian Liberation Fight erupted against the Habsburg oppression. The first Hungarian Government was formed led by the first Hungarian Prime Minister, count Louis Batthy�ny. The "Small Coat of Arms of Hungary" was re-instituted, even though Hungary was a republic now. In December 1848, Habsburg Emperor Ferdinand V, reigning in Hungary as well, resigned and Franz Joseph became the new Emperor. The Hungarian Government declared Franz Joseph's proclamation as being the Hungarian king illegal and, as a result, dethroned the Habsburg Dynasty from the Hungarian throne. Louis Kossuth was appointed as Governing President of Hungary. Hungary was confirmed again as a republic and Louis Kossuth, as one of his new measures, established a new Coat of Arms for Hungary, which did not have the Hungarian Holy Crown on the top. This formation is known the "Kossuth Coat of Arms" which later has become associated with the general idea of freedom fight for Hungary (e.g., the freedom fighters during the Hungarian uprising in 1956 also used the Kossuth Coat of Arms as their insignia). It may be controversial why Louis Kossuth removed the Hungarian Holy Crown from the Small Coat of Arms of Hungary. It could be theorized that he wanted to emphasize that Hungary is not a kingdom anymore, but it probably would have been better if he does not touch the Holy Crown. The Hungarians are, as they have always been, very sensitive about their crown. They do not necessarily look at the Holy Crown as the representation of the official state administration as a kingdom, but, according to the Holy Crown Theory, they consider the Holy Crown as the representation, the embodiment of entire Hungary, as a Father Land. Something which is above anything, be it an emperor, a king or the official state of administration; something which is from God, in which Hungary, as an entity resides. Whatever was Kossuth's assumption for removing the Holy Crown from the coat of arms, he later overwhelmingly proved that, as every good Hungarian, he is aware of and respects the importance of the Holy Crown. He kept it in special care, protected by guards, rescued it from Budapest to Debrecen, in January 1849, and when the Hungarian Liberation Fight eventually fell in 1849, it was him who hid the Hungarian Holy Crown and the Coronation Jewels into a wooden box and dug it in a willow forest, near Orsova, Transylvania. Here is a scan of this CoA from a book called "Flaggor i f�rg" (swedish title) though it is written by a Dane. The danish title would be "Flag i farver". The english title would be "Flags in coulor". The author is called Christian Fogd Pedersen. The copy that I have was printed in Sweden in 1981 by the publishing house Almqvist & Wiksell F�rlag AB, Stockholm, Sweden.The first issue was printed in Denmark in 1978 by the publishing house Politikens Forlag, K�benhavn(Copenhagen), Denmark. 16 October 1944 - 8 May 1945 - Hungary was under direct German controll. The Hngarian Quisling was Ferenc Sz�lasi, "the leader of the nation". This version of the Hungarian CoA was in official use from 27 January 1945 to 8 May 1945 only in the German occupied Hungarian territories later in Germany. This version of the CoA was in official use on the State Seal. Around the CoA there is an inscription: 'MAGYARORSZ�G NEMZETVEZETOJE' means 'THE LEADER OF THE NATION OF HUNGARY'. Resolution: 23/1945.M.E - This resolution modified the 3970/1915. M.E. 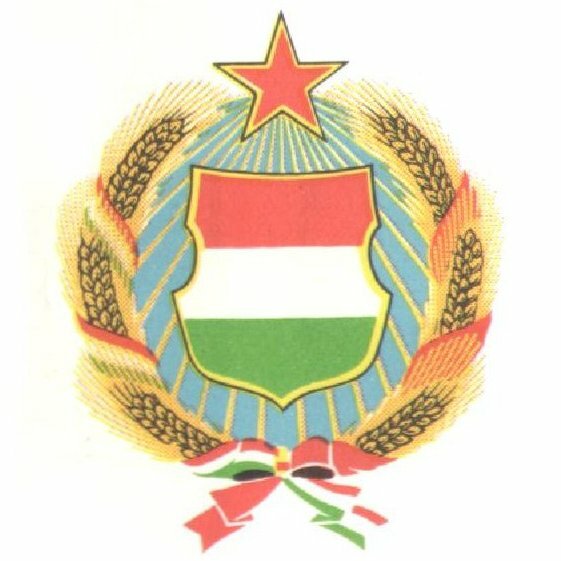 resolution about the Hungarian State Coat of Arms and The Hungarian State Seal.